Armadillos are members of the superorder Xenarthra (“xenarthra” means “strange joint”). This is a relatively small branch of mammals that developed in isolation in South America around 50,000,000 years ago. Xenarthrans are defined by the xenarthrous process, a small spur of bone found on the lumbar vertebrae that helps to stiffen the spine. Other mammals do not have this particular bony bump. There are three groups of animals within the order Xenarthra: Sloths, anteaters and armadillos. The armadillos are more distant relatives to these animals, while sloths and anteaters are fairly closely related. Armadillos belong to Order Cingulata; both sloths and anteaters belong to Order Pilosa (“hairy”). 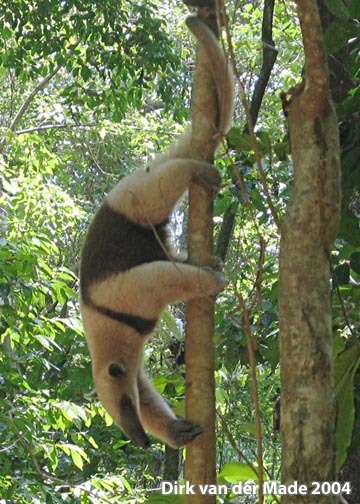 Two-toed sloths (family Megalonychidae) and three-toed sloths (family Bradypodidae) belong to suborder Folivora (“leaf-eating”), while the anteaters (family Myrmecophagidae) belong to suborder Vermilingua (“worm-tongue”). You can learn more about xenarthrans by visiting Xenarthrans.org, the official website of the IUCN/SSC Anteater, Sloth and Armadillo Specialist Group. 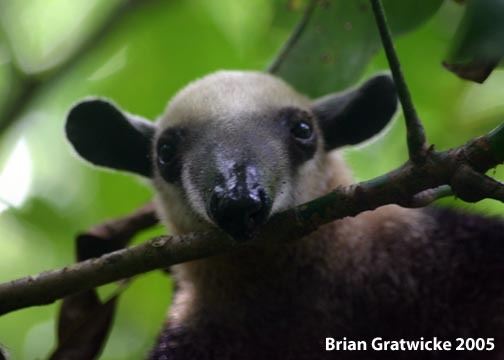 South American anteaters have long noses, long sticky tongues, and strong sharp claws, but they do not have any teeth. The largest species is the giant anteater, or ant bear. While normally not aggressive, these animals can be quite dangerous due to their size and sharp claws; in 2006, a female zookeeper was attacked and killed by an adult giant anteater. The Online Anteater website is maintained by Maia Weinstock, a researcher and reporter for Discover magazine. This site should tell you everything you need to know about the giant anteater. UM’s Animal Diversity Web is an immense project encompassing everything in the animal kingdom. If there’s an animal you need to know about, and you can’t find anything on this site, you might as well give up! This site is very large and very extensive. Sloths are leaf eaters. 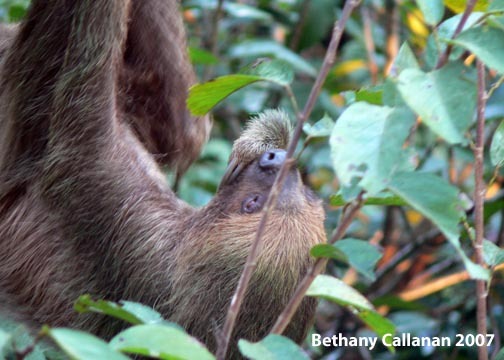 This diet is poor in nutrients, but sloths make up for this meager diet by conserving as much energy as possible. 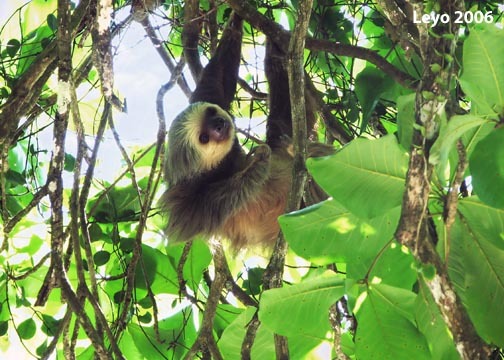 As a result of this energy conservation, they move very slowly (the family name for three-toed sloths, Bradypodidae, literally means “slow foot”). Many sloth species have a greenish appearance due to the algae that grows in their long, coarse hair. The Official SLOTH WebSite and Armadillo Online are two of the oldest xenarthran sites on the web. If you’re looking for information about the sloth — either the mammal, or the 7th deadly sin — you need go no further! You may have heard that the armadillo is related to some other animals, like opossums, rodents, or other ant-eating animals from Africa and Asia. This isn’t true. Armadillos are only closely related to other xenarthrans — South American anteaters and sloths. This group is unique to North and South America, and is not closely related to any other group of mammals. The mammal that is most often confused with an armadillo is the pangolin (Order Pholidota). The pangolin looks fairly similar to an armadillo because they have very similar lifestyles — they both tear apart termite mounds and anthills with strong claws, they both have narrow noses and long tongues, they both have a protective “shell”, and both like to hide in the undergrowth to escape from predators. Aside from the fact that pangolins are found only in Africa and Asia, and armadillos are only found in the Americas, there is one easy way to tell them apart. 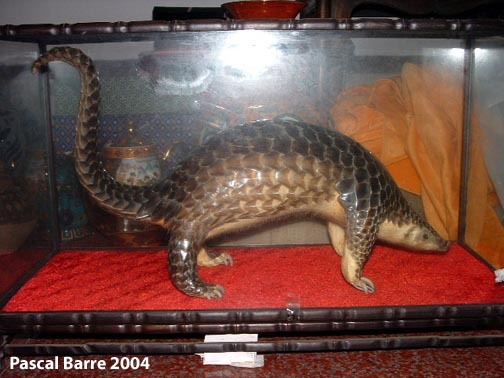 Pangolins have a scaly appearance. They are covered with a layer of flat leaf-shaped plates made out of keratin, the same material that makes up your hair and fingernails. 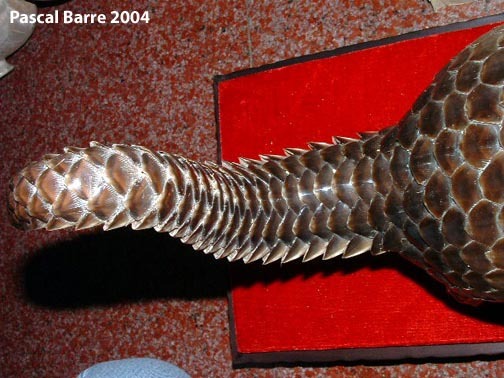 This “armor” surrounds the entire body of the pangolin. Armadillos have a shell made of bone that only covers the top of the body and the tail. 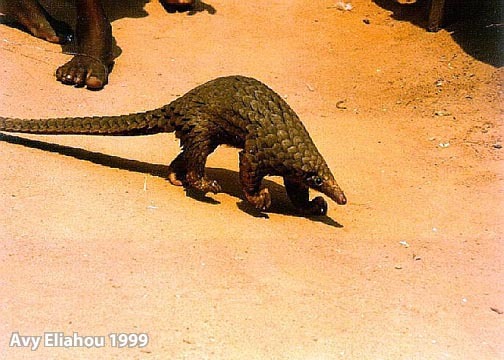 Look at the pangolin photos below, and compare them with the armadillo photos shown elsewhere on this website. 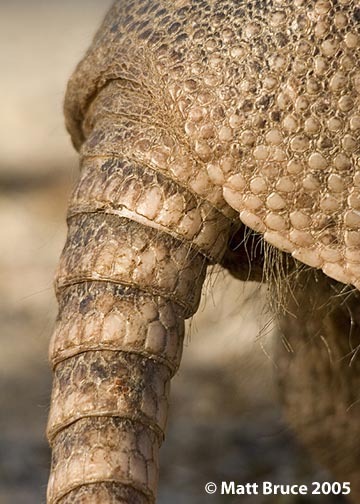 Note especially the close-up photo of the pangolin tail, and compare it with the close-up of the armadillo tail shown here. Can you tell the difference between these animals?